I had heard a lot of mixed reviews about Athens before our trip and so I didn’t really know what to expect. Some had loved it and others had commented that it was dirty, unsafe and only worthy of a couple of days. What did we think? We thought it was a fantastic city and really enjoyed our three days there. In fact, we could have spent much longer in the city. I know many people rush through Athens on their way to the Greek islands, but I think that is a big mistake. Our trip to Greece was motivated by Ella’s intense interest in Greek mythology, fueled by the Percy Jackson book series. She had a long list of Greek sights on her list that she wanted to visit and many of them were in Athens. Read my full post about our Percy Jackson inspired trip to Greece, with itinerary information. We stayed in the Koukaki area, near the Acropolis Museum, which was really convenient for getting to the major tourist sights, but also was full of real Athenians. Athens is a very walkable city and we spent most of our time in Plaka, and Monastiraki. You don’t have to work hard to sight see in Athens; just walking through the streets, you are confronted by history with ruins littered throughout the city. Download the Rick Steves audiotour and explore the city with Rick’s interesting commentary. While you can wander the city easily on your own, we took two tours while in Athens, which really elevated our visit. 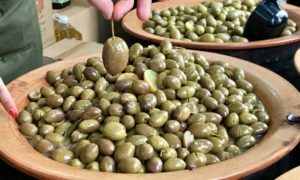 We did a food tour with Athens Food on Foot, where we tried so many foods, some familiar, but many new to us. The second tour we did was a Mythology tour of the Acropolis with Greeking.Me where learned so many interesting things about the Acropolis and the mythology behind ancient Greece. 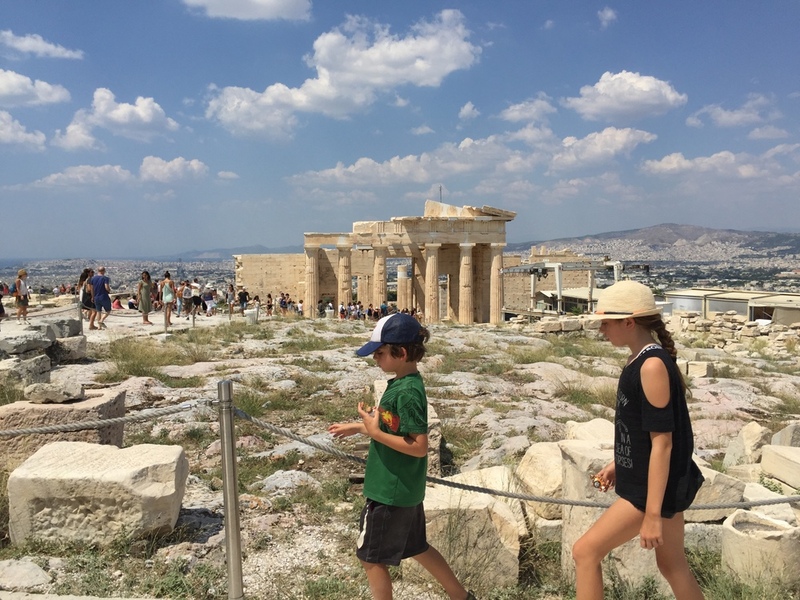 Both of these tours were really kid-friendly and allowed us to get so much more out of our visit to Athens. 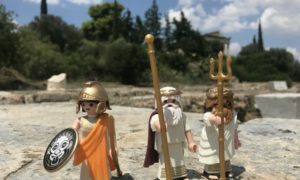 If you are visiting Athens, here are our top picks for the best things to do in Athens with kids. Before you go, check out these Europe travel tips. Like many European cities, Athens does not have a core city centre with high rises. Instead its low rise buildings are spread out over the dry hills, creating a sea of white. For the best views in the city, head to Mount Lycabettus where you can look out over the city, spot the Acropolis and even the Aegean Sea. Kids will love taking the funicular up the hill, even if you can’t see anything on the way up. Once at the top, take in the beautiful views or have a drink or meal at the hilltop restaurant. Tickets cost 7 euros/return, half-price for children. Plaka is the neighborhood right beside Acropolis Hill and with its picturesque narrow lanes built on the hills and restaurants that spill out into the squares, it is easy to see why it is a tourist favourite. It is a lovely area of the city to walk around and while many of the restaurants cater almost entirely to foreign tourists, eating al fresco in the narrow streets is so classically Greek. We were introduced to the Anafiotika neighborhood on our food tour and it is definitely an area of the city that you don’t want to miss. The area was settled when people from the island of Anafi came to Athens to work on the King’s construction projects. The homes are built in the Cycladic style with white walled homes and brightly flowering gardens. We loved Monastiraki because it was a great melting pot of locals and tourists. The area shows off the city’s Ottoman and Byzantine history and buzzes with activity. The Monastiraki flea market offers up lots of shopping opportunities and you are never far from a souvlaki joint. Also be sure to check out Lukumades (EOLOU 21 & AG. EIRINIS) for fancy loukoumades (Greek donuts). You might be tempted by the elaborate flavour combinations, but stick with the traditional, honey and nuts. Greek food is fantastic, but so often tourists just stick with what they know – souvlaki and moussaka. Both of those dishes are divine, but our food tour with Athens Food on Foot allowed us to experience so many new foods, while learning a ton about the city and culture. They offer a family tour with lots of stops that the kids and adults will both love. We visited the central market, tasted staples like olives and Greek pies (spanakopita), but also a bread snack called kalouri, Greek yogurt with honey and nuts, sardines, cheese and deli meats and more. She was also able to customize the tour for us vegetarians with some meat options for our carnivore children. We did our food tour on our first day in Athens and it was the perfect introduction to Athens, Greek food and Greek hospitality. Cost 64/euros adults, 25/euros children. The Acropolis is the most important historical sight in Athens and is not to be missed. The Parthenon is the crown jewel of the Acropolis – an incredible building built by the world’s most advanced civilization. This is the highlight of visiting Athens with kids for most families. Our Mythology tour with Greeking.Me took us through the Acropolis and the Ancient Agora and having our own private guide was incredible. It was a sweltering 38 degrees in August when we were there, but our guide, Aris, explained what we were seeing and wove in interesting stories and mythology that was perfect for our mythology obsessed daughter. We got so much more out of our visit because we had a guide and we came away with a much better appreciation and understanding of the Acropolis. The Parthenon was the visual highlight, but it was the stories about the different Greek Gods that we found the most interesting. Cost: 59 euros/adult, free for children under 10. 4 hour tour. Sometimes we are scared to visit museums with our kids, but the new Acropolis Museum is a wonderful place to visit with kids. Starting with the lego and miniature model of the Acropolis, the kids were immediately impressed. When you arrive, make sure you pick up the kids backpack with a map to find all of the statutes of Athena throughout the museum and historic-themed games. Cost: 5 euros/adult, 3 euros/children. Syntagma Square is Athen’s most important square and the centre of commercial activity and Greek politics. Many countries in the world have elaborate changing of the guard routines and at the Hellenic Parliament building across from Syntagma Square you can see the Greek version, every hour on the hour. The official ceremony happens every Sunday at 11 am, but we thoroughly enjoyed the once hourly ceremony on a weekday. The ornately dressed soldiers with elaborate and precise footwork is a great free thing to do in Athens with kids. The Temple of Poseidon at Sounio is 1.5 hours outside of Athens and features prominently in the Percy Jackson books. It was one of Ella’s requested stops and is a popular half day trip from Athens. The Temple of Poseidon’s gleaming white columns overlooking the sea was built in the same year as the Parthenon. You can visit as part of a tour, hire a taxi, or we visited on the day we had a rental car. While the Temple does have a spectacular location overlooking the sea, there isn’t that much to see or do there. I wouldn’t go out of your way to visit unless you are a real mythology buff. Cost was 8 euros/adult, free for children. We had trouble with taxis scamming us that left a sour taste in our mouths in Athens. As a family of 5, most would not take us in one taxi. One did agree to take us from the airport, where it is a fixed price 38E into the city. He was super friendly the whole drive chatting away to us. Unfortunately when we got there we didn’t have change and he wouldn’t give us change from a 50E note since he said we should have taken 2 taxis. Not a great introduction to the city. Another time the kids were really hot and tired and we got in a taxi without a meter and we paid 20E for a short ride (he did tell us in advance the price). All taxis are required to have meters, so make sure you use taxis with a meter and make sure they actually use it. We did try to use the metro once and found it quite confusing. 90-minute metro tickets are very reasonable at 1.40E, kids 60 cents, but the station we were in had no person working and the machines would not allow us to buy a reduced (kids) ticket. There are good value multi-day tickets for tourists if you will be using the metro daily and are taking it from the airport. Metro – 10E /adult, 5E/child, can also purchase return tickets. Taxi 38E set fare, payable to the driver at the taxi stand. Drivers are hesitant to take families of 5. For larger families, Airbnbs are a great option in Athens. We stayed in a wonderfully retro 3-bedroom apartment near the Acropolis station. The location was incredibly convenience for getting to the most popular areas, but it was populated with mostly locals. We were welcomed by our host’s parents with kisses, fruit and sweets and wonderful Greek hospitality. If you have never used Airbnb before, use this link to save $50 off your first booking. If you are looking for the best prices of hotels in Athens, check out Booking.com. Tipping – round up, no need to tip 10-15%. Order meals to share – the servings are huge and it is more fun to share. You will often be charged for the bread on your table – this annoyed us in the beginning, but the bread is good and it is rude to send it away. You get a lot for the price you pay and we never had a bad meals while in Athens. We thought Athens was a great city to visit with kids. The Greek ruins are the main draw, with food being a very close runner up. We loved just wandering the neighborhoods in the city centre. Although Athens is slightly more expensive than other parts of Greece, we found that it represented really good value. We spent 3 days in Athens, which gave us time to see the main sights without rushing around too much. 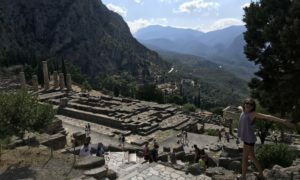 It was the beginning of our love affair with Greece that continued as we headed off into the Peloponnese on our self-guided Percy Jackson tour (more to come on that). I cannot wait to take my kids to Athens and to visit myself (I’m a history teacher). The history was incredible and I loved seeing the kids soak it up. Hope you guys get there soon – you will all love it! From what I remember, the streets would be fine with a stroller. I do think Athens is better when they are a bit older and can understand the history more. The Greek islands with the little ones might be more enjoyable and save Athens for when they are older. It really is a spectacular destination with kids. We can’t wait to go back and see more! Our boys were just 9 months old and 2 when we took them to Athens. I think it’s time for another visit! I always think how amazing the Greek Islands would be to visit, but I just the other day I heard someone mention how great Athens was to visit. Good to know that it’s great for kids too. We love exploring new cities and Athens looks like a great place to do this! It really is a great city to explore with kids. We didn’t do the islands on this trip, but are eager to get to them one day. Athens with Kids, I bet you did a lot of walking! Do they also read the Greek mythology book? Yep, my daughter is a huge Percy Jackson fan and she loved learning all about the mythology.